Auntie Anne’s FREE Pretzel Day on September 21 Happy 20th Anniversary Auntie Anne’s Philippines! Rush to Auntie Anne’s stores for a FREE Pretzel on September 21 as they celebrate their 20th Anniversary in the Philippines! Auntie Anne’s is the world’s largest hand-rolled soft pretzel and this is a delicious treat that you don’t want to miss! Grab your FREE Pretzel on September 21, Monday, from 1:00 PM-4:00 PM at Auntie Anne’s store near you. 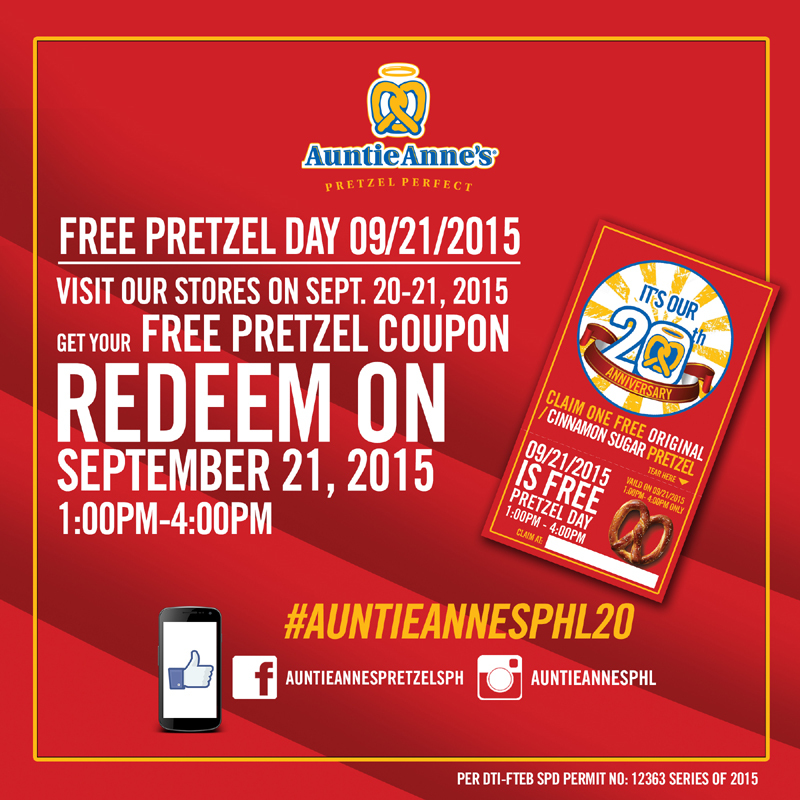 Simply get a free pretzel coupon from the nearest Auntie Anne’s store on September 20 (Sunday) and September 21 (Monday) to enjoy Auntie Anne's pretzel treat. Visit Auntie Anne's Philippines on Facebook to know more about Auntie Anne's Free Pretzel Day. Share your Auntie Anne’s free pretzel on Facebook, Twitter or Instagram and use the hashtag #AuntieAnnesPHL20.